I believe they have a Portuguese soul once they were made by very little hands belonging to a 9 years old Portuguese child. Yesterday, when I arrived, I had this surprise waiting for me! 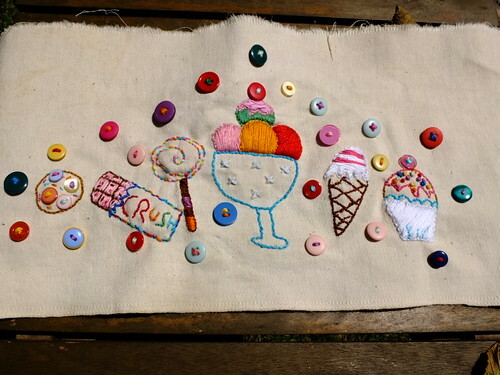 My youngest daughter made this piece of embroidery by herself... The drawing is hers... Stitched by her little hands... I can assure I was not there to help her! I'm so proud that I couldn't resist to publish her work... I hope you like it!! For our Portuguese class I've chosen two great words... Mother and daughter - "mãe" and "filha". Wish you all a sweet week! This is adorable! Your daughter is very talented! That swirly lollipop just might be the best thing ever. How wonderful! That is wonderful! 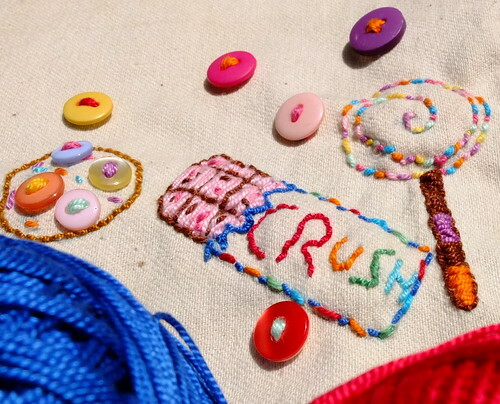 I love the way she incorporated the buttons and wasn't afraid to use lots of color. These kinds of gifts are my favorite!!! wow!!!!! She did a great job! No wonder you're proud!!! It looks good enought to eat! You have a very talented daughter - just like her mum!! 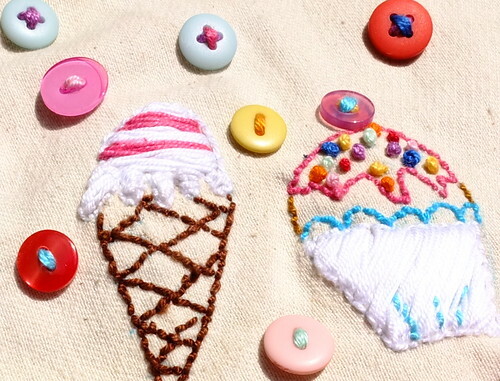 Love all the ice creams and sweets and the buttons add the finishing touch!! I am so jealous of her amazing skills! From design to execution, it's fabulous! OMG! 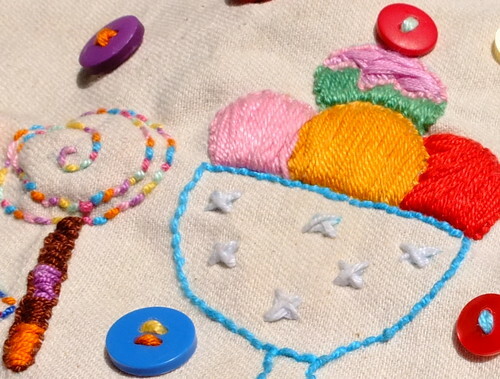 A sweeter stitchery I've never seen!!! This is absolutely enough to bring me to tears! I cannot imagine how you felt when presented with it from your totally amazing daughter!!! WOW! It blows me away!!! Oh, wow! She did a great job—wonderful design and great embroidery! wow...puts my beginner stitches to shame. That's a wonderful piece of work, really cheerful and colourful.